Chihiro Enomoto is a freshman that just got to a new school called Rikkyoin High School. He lost his parents in a traffic accident when he was 10. Since then, he has been living only with his elder sister Shinobu. He is good at cooking and cleaning, and does all the housekeeping jobs. He fell in love with Tokino at first sight when he met her in the school library on the first day of school. Another girl named Ritsuko, a childhood friend of Chihiro and the chair of student council, falls in the love with the boy instantly after this long-awaited reunion. But she is not the only one who is in love with him. This is the story about a one-year campaign among the candidates for the next students government leaders, who are also chosen by the lot (kujibiki), in order to gain the position. 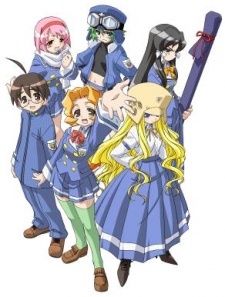 Watch Kujibiki Unbalance Episodes Online at Animegg.org. Kujibiki Unbalance is available in High Definition only through Animegg.org. Choose an episode below and start watching Kujibiki Unbalance in Subbed & Dubbed HD now.